Recent release “Through the Frost” from Page Publishing author Josh Greer is an adventure-packed book about Wass, the Ikea’s champion, and Vendish, the king’s nephew, and their mission to unite the people against the giants called the Ut’ki, whose eyes are fixed on the kingdom of Cellius. 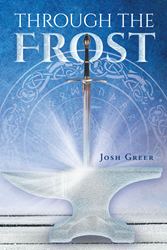 Josh Greer, a dedicated author, has completed his new book “Through the Frost”: an engrossing story of the journey of a king’s nephew to Fimblewinter—with the guidance of Wass, the champion of the frozen wastes—in search for a legendary weapon to save his homeland from the Ut’ki, brutal giants that, according to legends, would destroy anything they have set their sights upon. Author Greer shows how powerful the enemy that has to be defeated is: “‘The northeast tower has fallen?’ Vendish questioned. He could hardly believe such a feat was possible. Barruk Jol was the first of the great watchtowers to be built around the kingdom and had already weathered the ice and storms of an age without falling. He could not fathom the force that could attack it and destroy it so utterly as to cause such a reaction in his uncle. ‘The Ut’ki destroyed it in only two hours,’ Skengir confirmed. Published by New York City-based Page Publishing, Josh Greer’s absorbing novel takes the readers to the thrilling journey of Vendish and Wass into the ice and snows of Fimblewinter. Unifying the people of Cellius is a task given to Vendish, and no matter what, he is set to do so before it’s too late. Readers who wish to experience this fascinating work can purchase“Through the Frost” at bookstores everywhere, or online at the Apple iTunes store, Amazon, Google Play, Kobo or Barnes and Noble.